Those of you who are feeling quick-witted enough will have noticed that the first 3 of my 10 above give a rough translation of Doddiscombsleigh (I apparently wasn’t wrong about the ‘whole sentence’ thing). All you need to add is a postcode and you would have a perfectly serviceable postal address. If you lived on the Isles of Scilly by the way, that address would almost certainly get your Christmas card to the right house! B2, Dartmoor… (‘Dart’ by the way, means ‘oak’). 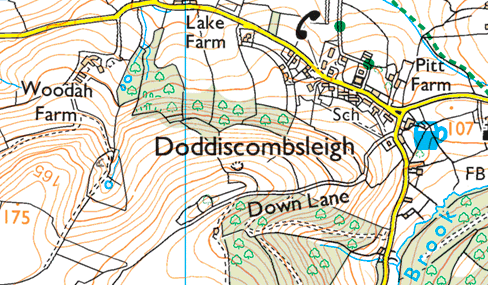 One of the very few things I learned in Geography lessons back in my schooldays was that a valley was open at each end and a comb, combe, coomb, cwm (Welsh) was closed at one end. The only other thing I remember learning was that stalaCtites hang from the roof like iCicles and stalaGmites grow on the Ground. I hope the Doddi isn’t for storing Kens. The Diddy people might object. It is amazing isn’t it, which snippets of information come back to you. I wonder what happens to the ones we forget.